Here’s my “Freaky Friday Fashion” pic for the week, a skull cap. 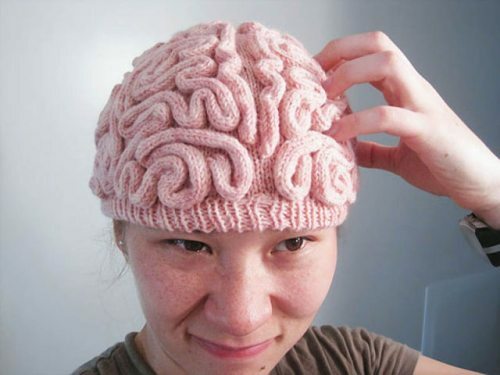 Whoever the brain child is behind this creation, gets 2 thumbs up for brilliantly recreating the traditional skull cap. Although this is rather freaky, I find it rather humorous as well. I love the pink, fresh look of a healthy brain, but I do think there should be some options. Next, they need to make one that’s black and burned with a touch of green to resemble a brain on crack. It could be a good campaign for drug abuse awareness. I’m just sayin’. 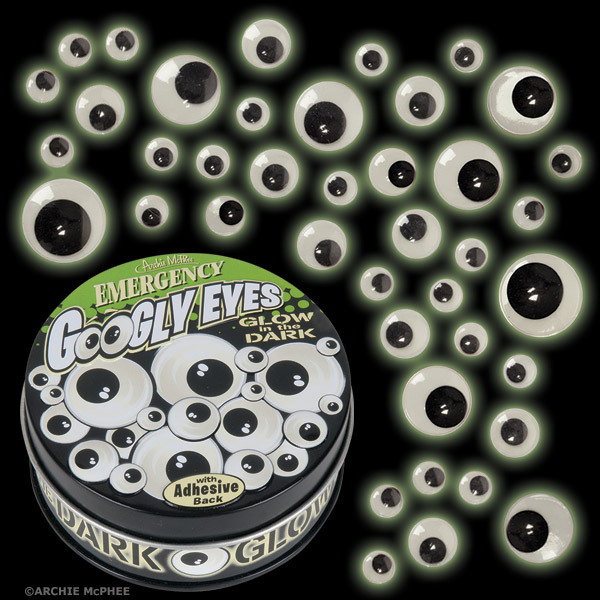 I spent all day yesterday working on my holiday deliveries for Roadkill Ranch & Boutique, and, at the end of the day, I realized I had dedicated a decent chunk of my open-to-buy to googly eyes. I think I may have gone a little crazy. I ordered small, medium and giant eyes. 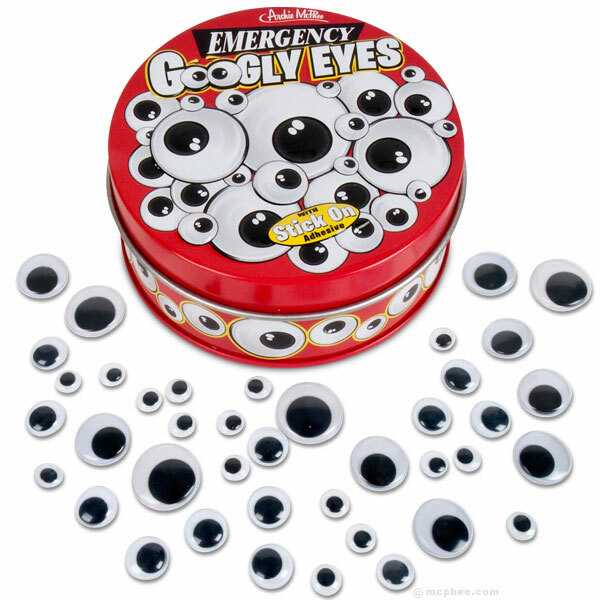 I couldn’t resist the mini emergency cans of stick-on googly eyes, so I bought them and the glow in the dark version too. They’re so cute and humorous and are guaranteed to add a little fun to everything. I’m going to keep my supply with me at all times. It will go something like this when I grab my handbag: iPhone- check. Lip gloss- check. Wallet- check. Keys and googly eyes- check. I’m pretty sure this googly eye trend will beat out the mustache and bacon trend. If not, at least the Roadkill Girls and I will be having lots of fun. The top picture is from the Blonds runway show, it’s an all-over, googly-eyed masterpiece. The rest of the pictures are of merchandise I ordered for the boutique. I’m gaga over googly eyes. I can’t wait for the day UPS brings us the coveted box. 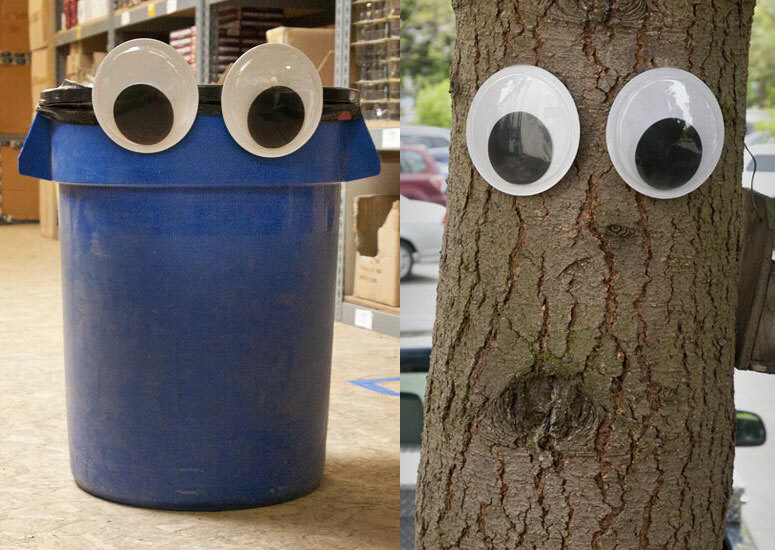 Trash cans, trees, backs of chairs, and, perhaps our toilet lid, will all come to life with the giant eyes. I’m sure the fruit in the fruit bowl and smaller household items will also begin to come to life as soon as my son gets a hold of the small eyes. Trend alert! Mark my words! Whenever we change out our windows, we try to keep the Ranch side different from the boutique side. Well, because, they’re different. 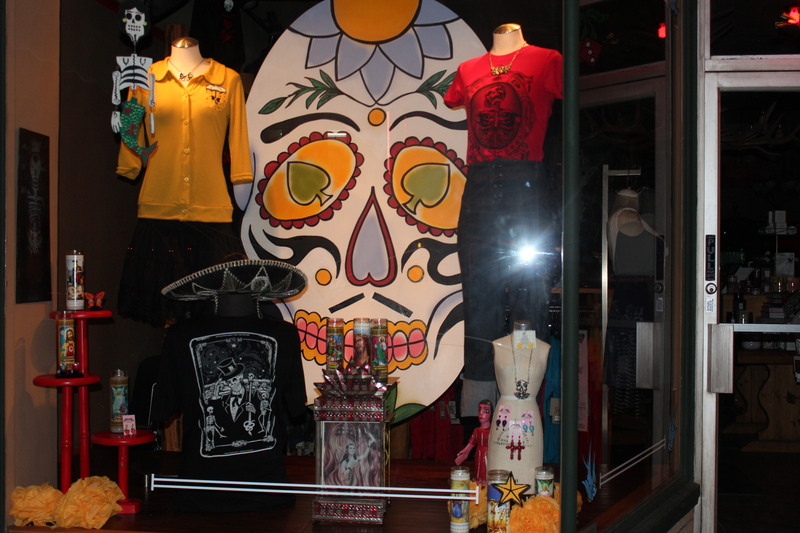 Our friend (and local artist) Leonard Fiedororwicz is an amazing window dresser and an awesome artist. Last year was the first time in 18 years that we gave an artist (Leonard) complete creative control over our window displays. So, I guess you could say that Leonard made history with the “Fun House” window, a circus theme with an edge that turned out incredible. This year he’s back with “The Day of the Dead” celebration. And, since Leonard is our featured artist this month for Fullerton’s Art Walk at Roadkill Ranch, we gave him the control over our windows again (it’s not an easy thing to do when you have 4 creatively, intense Roadkill Girls). 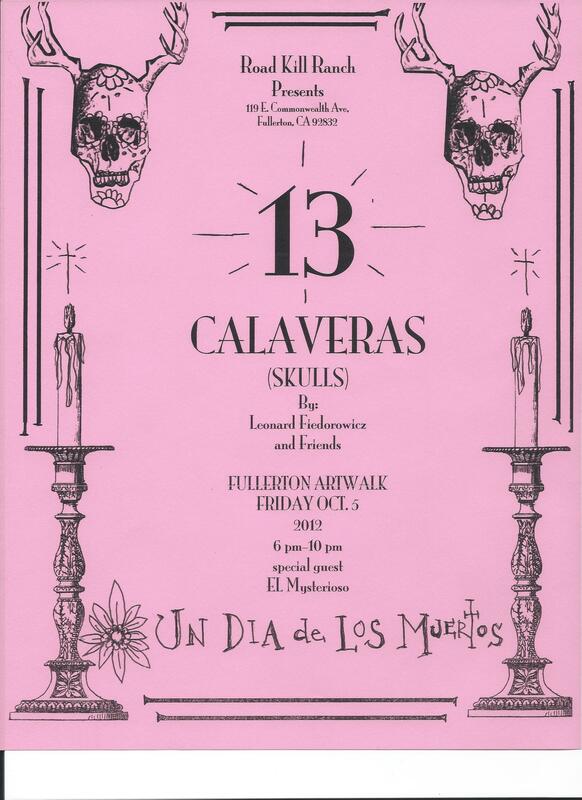 His exhibit is titled “13 Calaveras” and he has created 13 skulls to be featured. 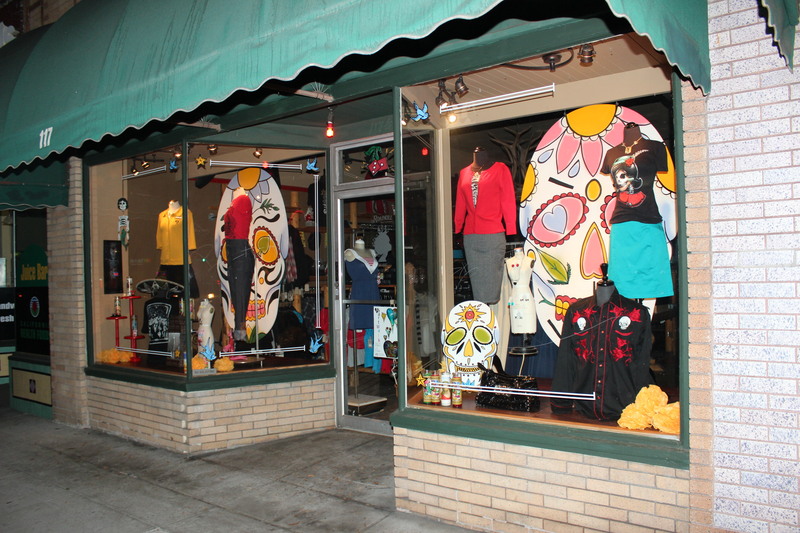 The 2 largest skulls are already hanging in the windows and they look fab! 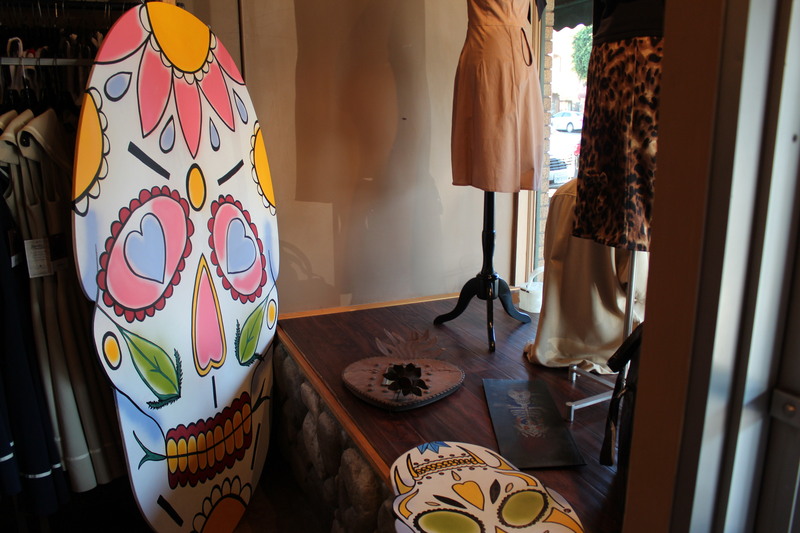 Each skull is made from wood, hand-painted, numbered and signed. And, they are all reasonably priced (along with some of his one-of-a-kind collectibles). The rest of the exhibit will be on display Friday from 6pm to 10pm. 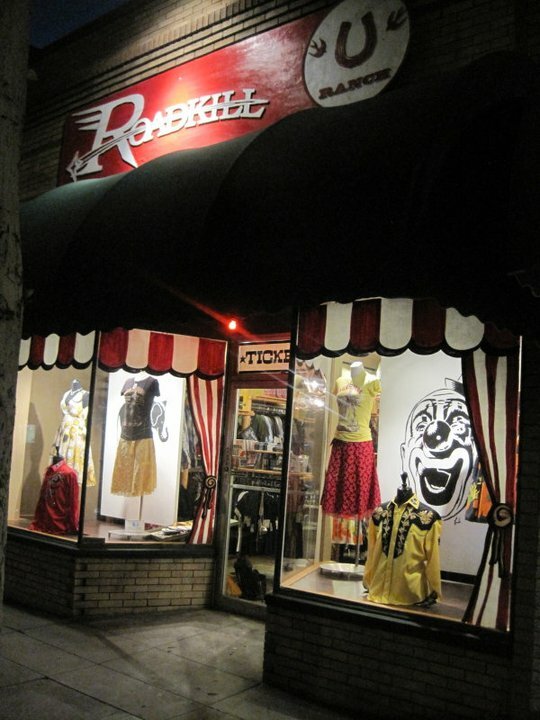 So, if you’re in the area, please stop by and see his amazing show, check out our windows, and pick up a skull or two. Leonard’s friend “El Mysterioso” will be entertaining us with his phenomenal, one-man-band Mariachi show. And, rumor has it…there might be sangria floating around. “Fun House” window by Leonard Fiedorowicz, 2011. History in the making.